The dramatic profile of Lobelia rhynchopetalum: so unexpected in a high alpine environment. 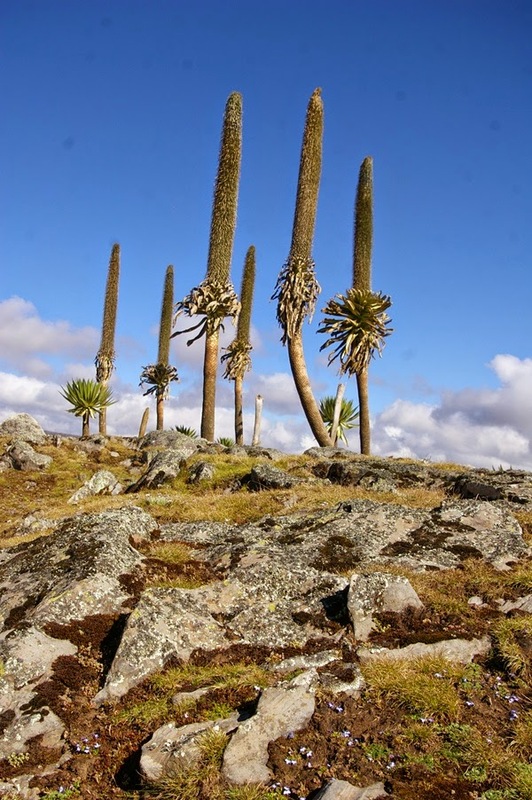 The high point, in every way, of the trip to Ethiopia, was the day we had in the Bale Mountains National Park; it was my third time there, but the first with really good weather. The previous trips had been a month or so earlier and the rains hadn't quite cleared southwards. 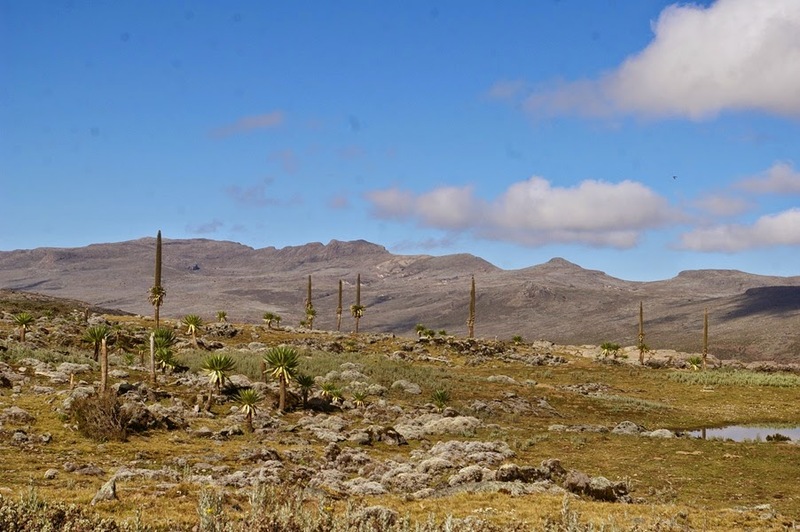 The Bale Mountains are a large massif rising south of the Rift Valley, the largest of several mountainous areas there, and an extremely important area for biodiversity in all classes of organisms. Much of the massif is nominally protected by a National Park, but encroachment is a problem and there is continuous forest clearance on the flanks of the mountains. 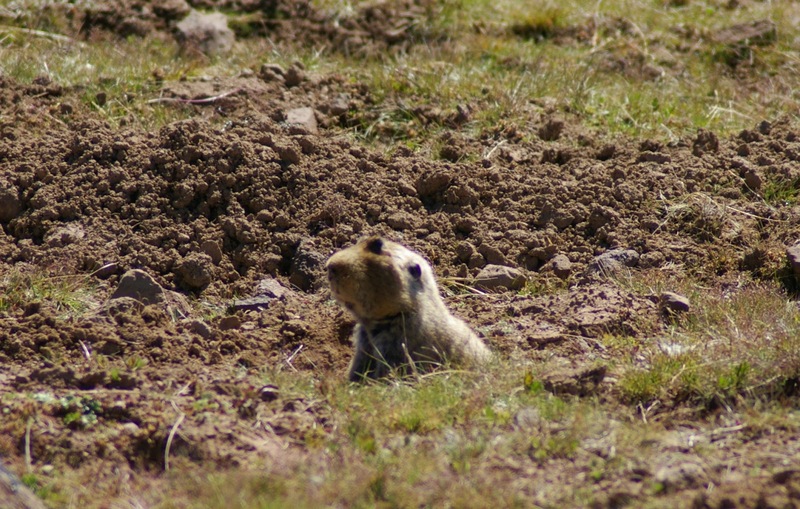 Nevertheless, the park has been instrumental in preserving a large area of habitat that would otherwise have been lost, and under its protection reasonably healthy populations of several large mammals remain. 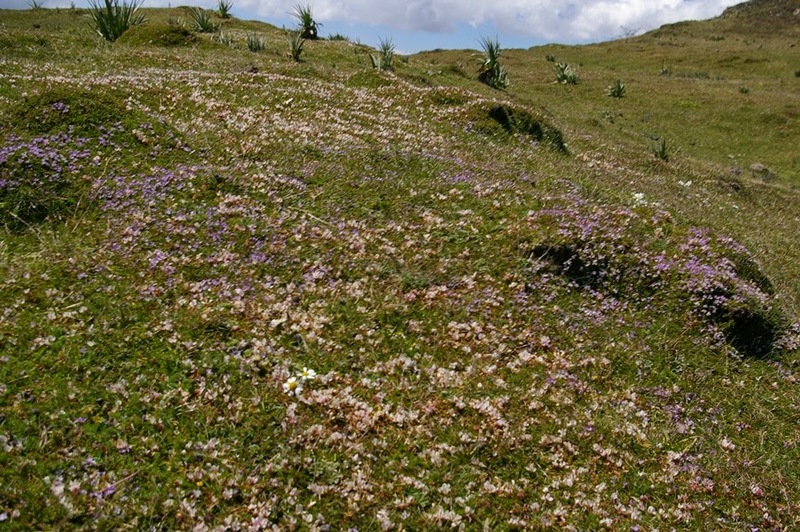 The centre of the park, the high altitude Sanetti Plateau, the largest contiguous tract of afroalpine habitat, is easily reached from the town of Goba to the north of the massif - a dirt road leads up and over the top to settlements on the other side. It's used by a surprising number of buses and lorries, and to judger by the great ruts inm the road many obviously have significant difficulties ion the wet season - as we did in 2007 when trying to get around in a minibus. With a 4X4 the road presents no problems when dry. 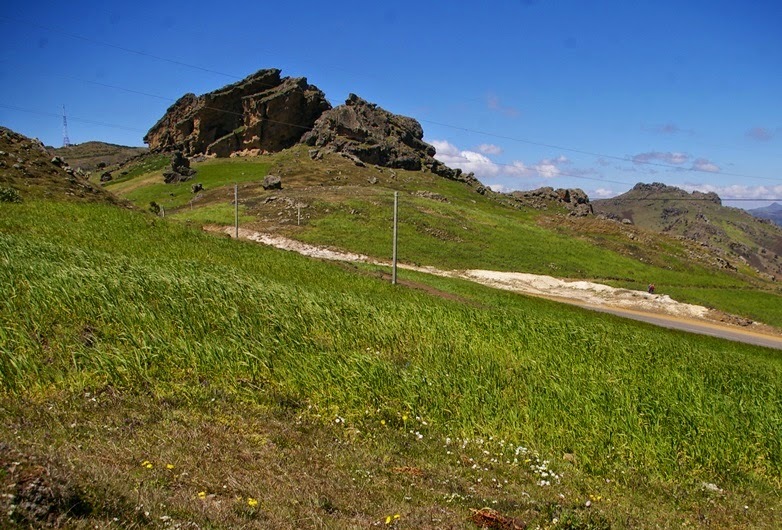 Looking toward the northern edge of the Bale mountains: little tarns are a feature of the Sanetti Plateau. 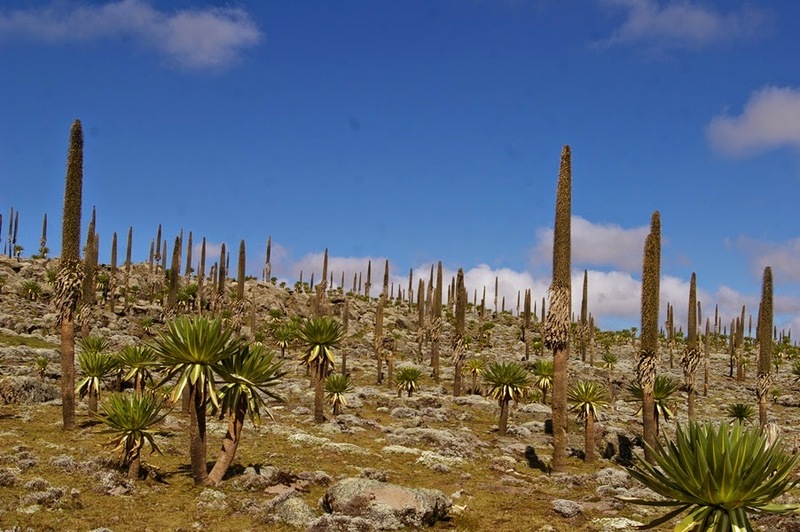 The ascent is quite rapid, from about 2700 m at Goba, to treeline at 3520 m, and the lip of the plateau at 3800 m: much of the Sanetti Plateau is at or slightly above 4000 m, so there is a risk of altitude sickness. Fortunately none of us was affected beyond a tinge of headache and slight breathlessness. Without doubt the botanical highlight of Sanetti is the largest of all of the giant lobelias, L. rhynchopetalum. 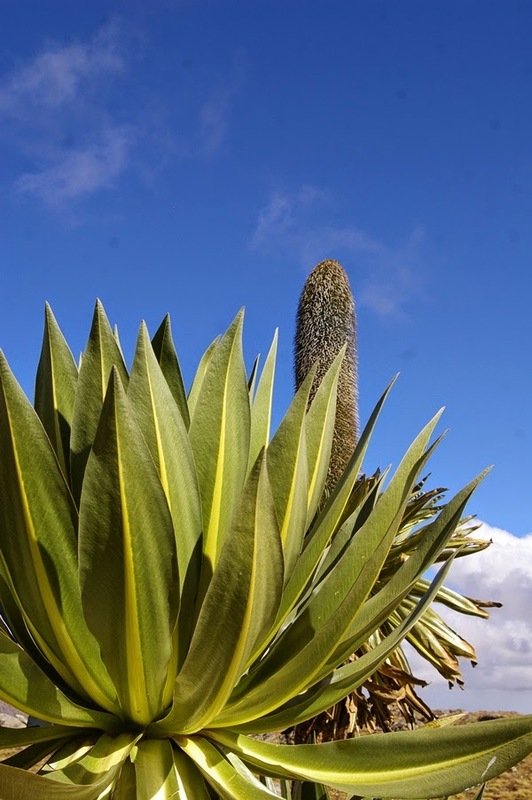 This gigantic plant, standing 4-6 m tall in flower, is endemic to the highlands of Ethiopia both north and south of the Rift Valley - none of the other species come close to it in stature. We seem to have hit a really good flowering year for it, to judge by the number of spikes to be seen, but most had now finished and were maturing their seeds. In a few a ring of light blue flowers could be seen on the spike, but in all cases too far up to be accessible for a picture. 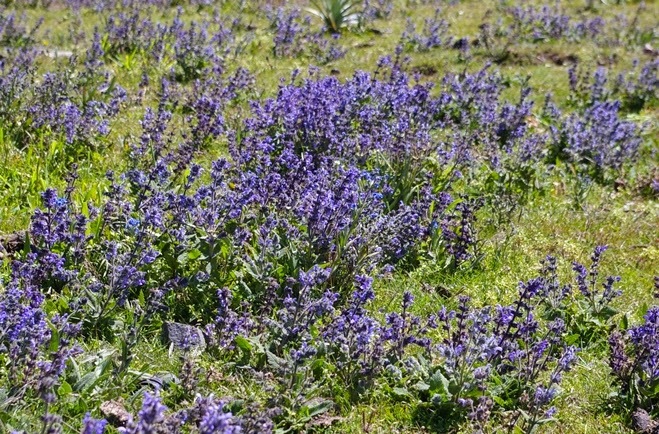 Mass-flowering of giant lobelias: the big rosettes will flower in a year or two's time. Seedlings start off as small, stemless rosettes. The rosette develops over a number of years, getting larger and increasingly elevated on a stout stem, taking about 12 years to reach flowering size. The inflorescence in the background still has fresh flowers in its upper portion, but the leaves are already senescing. 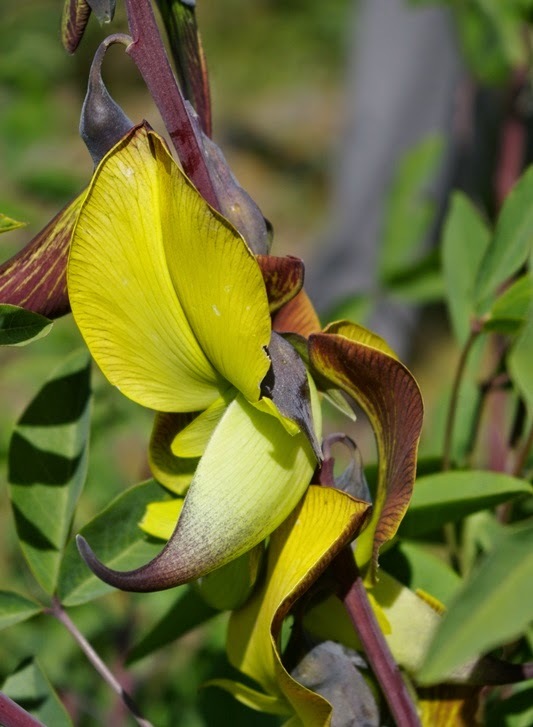 After seeding, the plant dies and collapses, leaving a heap of rather attractive 'skeleton'. 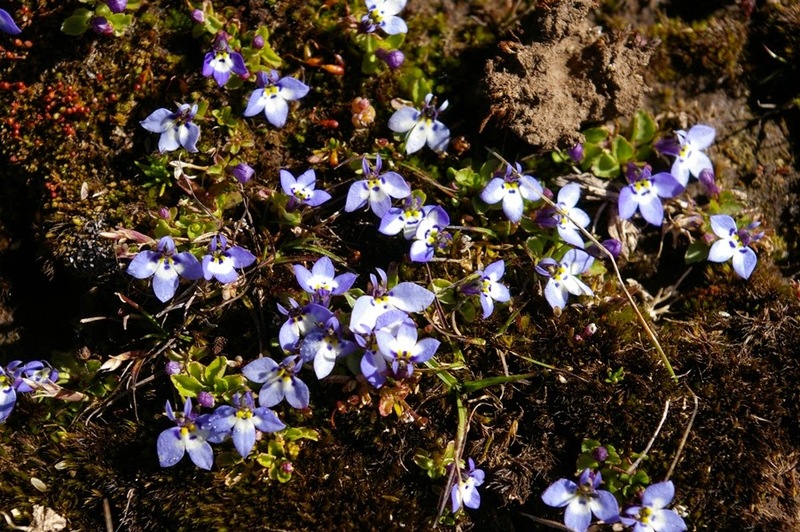 The giant and the dwarf: the tiny spangles of blue just visible in the foreground are the flowers of the minute, prostrate Lobelia erlangeriana - there could not be a more striking disparity in the sizes of plants in the same genus. Lobelia erlangeriana - a very pretty little plant. A tight tuft of Swertia lugardae. 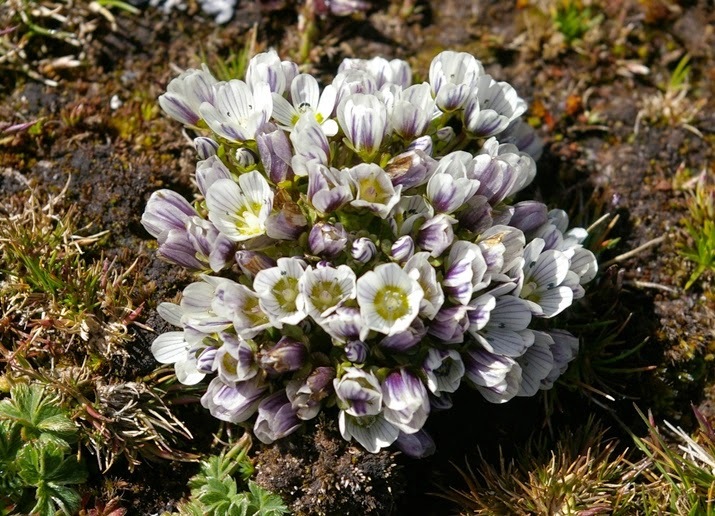 Swertia replaces Gentiana on the African mountains. 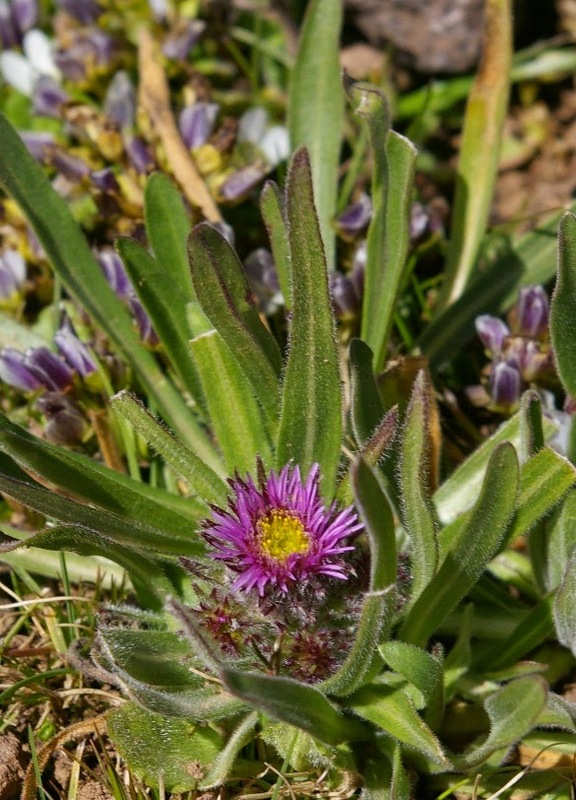 A widely-distributed plant, Erigeron alpinus is common in the European mountains, and occurs through Ethiopia to Mt Kenya. 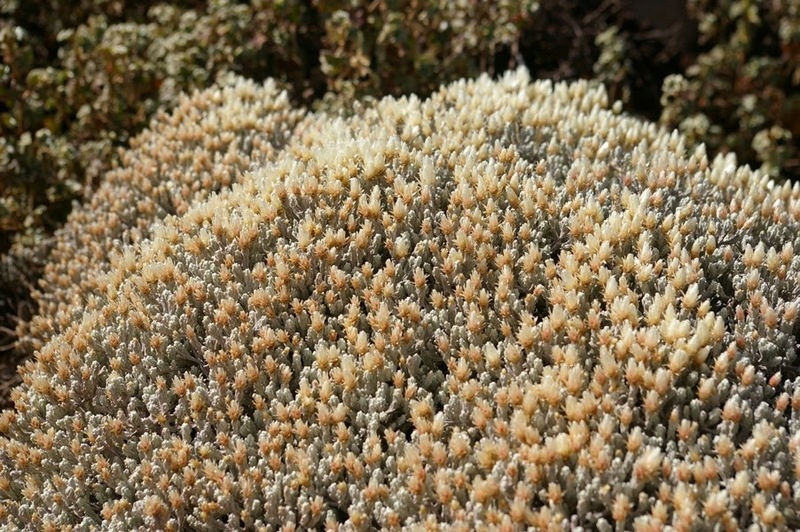 The very beautiful mat-forming Helichrysum gofense - white capitula above silvery leaves. 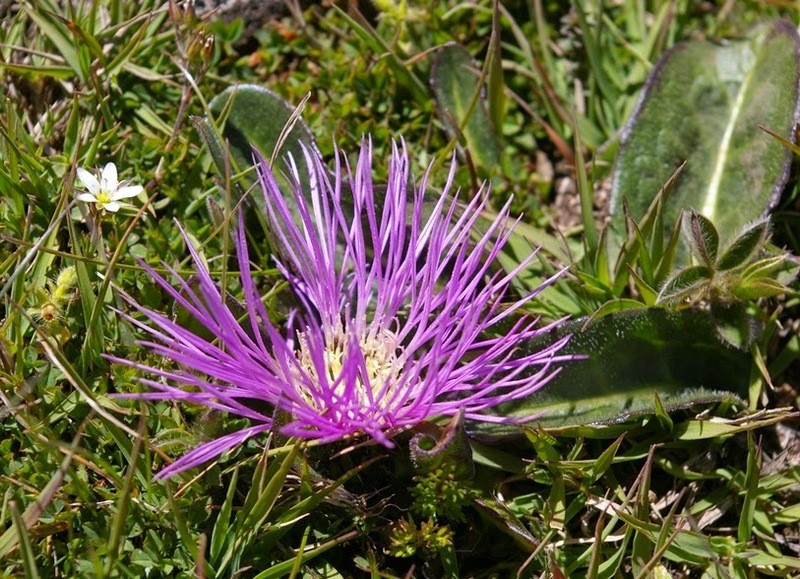 A common plant on the Sanetti Plateau, but it is endemic to high altitudes in Ethiopia south of the Rift Valley. An Augur Buzzard, Buteo augur, on a roadside boulder. 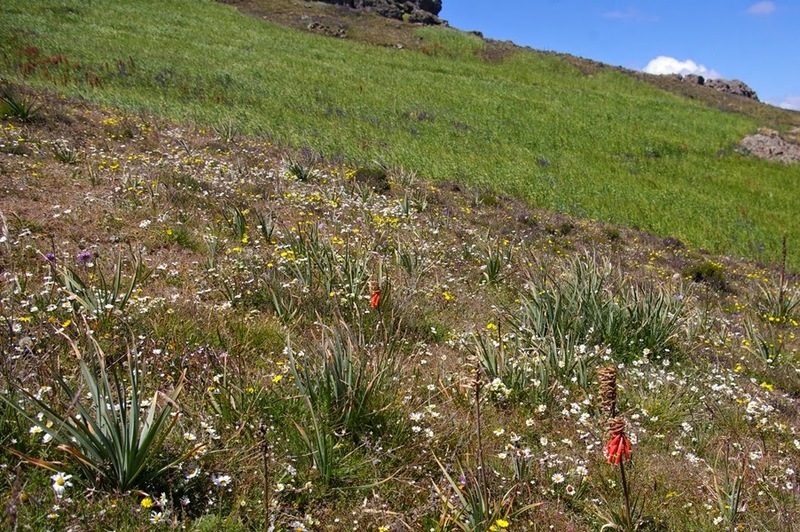 The grey vegetation in the background is the classic Afroalpine Helichrysum moorland, here dominated by H. citrispinum and H. splendidum. The subtly spicy scent of Helichrysum moorland is one of my favourites, now a very rare treat. The hill to the left, with a radio station on top is Tullu Demtu, the highest peak of Bale at 4377 m. We trudged to its top in foul weather in 2007. 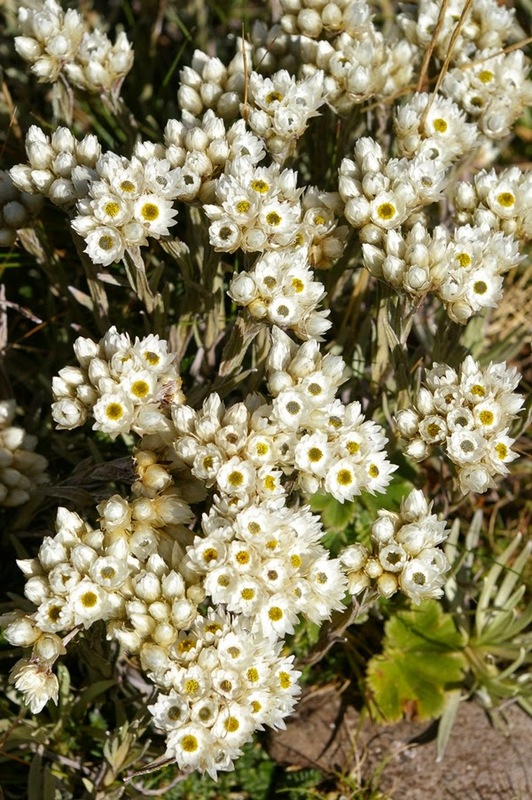 A bush of Helichrysum citrispinum covered in flowers. 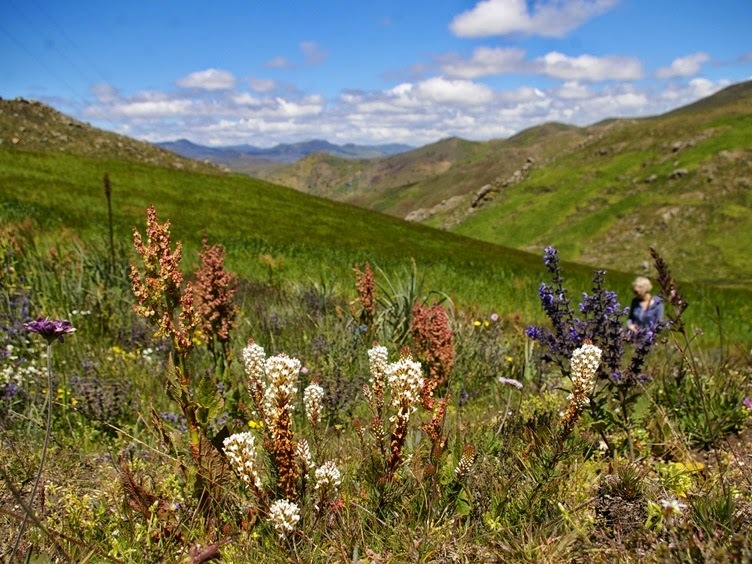 As its name suggests, Helichrysum formosissimum is the most beautiful of the Afroalpine species, though it grows just over the lip of the plateau, not in the exposed upper places. 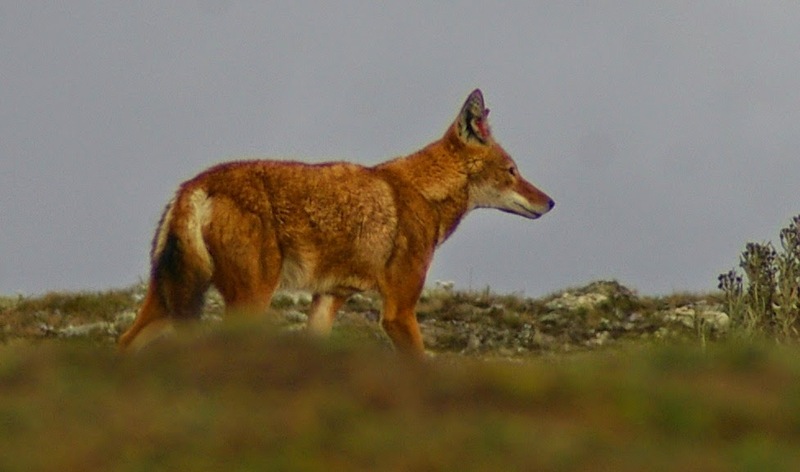 of which the Ethiopian Wolf is the most notable. 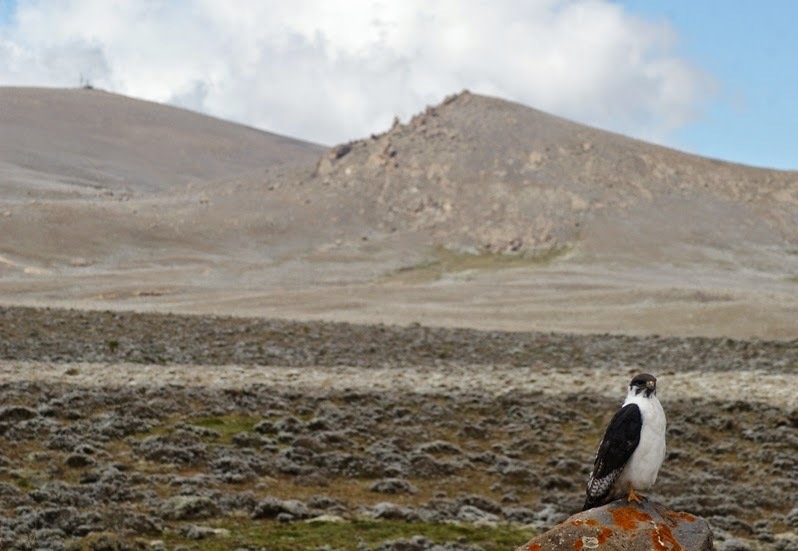 Half of the extant population (somewhere around 400 individuals) of this beautiful animal occurs in the Bale Mountains - we saw 5 on this occasion - but they are threatened by habitat loss and from diseases caught from domestic dogs. They are specialist rodent hunters, with a long muzzle for nabbing them from their holes. While writing this entry I realised that it marks the fifth anniversary of this diary, which started with a post about Kenya on 27 November 2009, a pleasing African symmetry. The fabulous dwarf form of Kniphofia isoetifolia, apparently known only from this ridge. 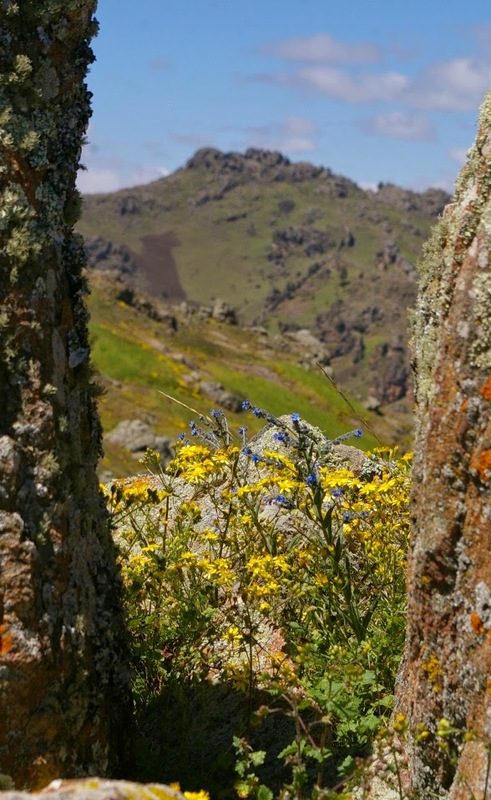 In 2003, travelling on what was then a rotten road, and in a hurry to get to our lodging with no time to stop, I spied a flash of an orange flower in alpine turf as we crossed a high pass on the flanks of the Bale mountains. Luckily, on the way back we were able to investigate, and found it to be an extraordinary dwarf Kniphofia - a truly exciting plant. 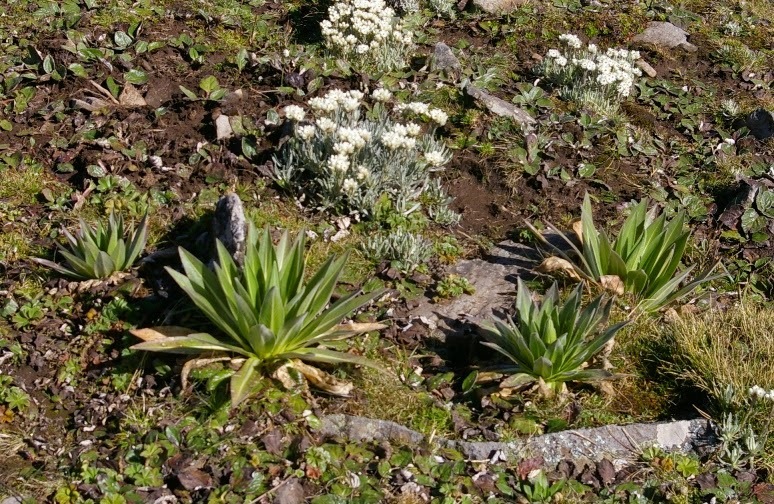 It didn't key out to anything in the flora, but later research in the herbaria in Addis Ababa and Kew showed it to be a dwarf form of K. isoetifolia, apparently only known from this ridge. When I took an Alpine Garden Society tout to Ethiopia in 2007 this spot was again a calling point, so I was keen to visit again this year. Since then a new tarmac road has been built along that route and while it means one can zip along in comfort, it was evident that much damage had occurred to roadside vegetation. My worst fears were realised when we got to the top of the pass: a heap of road spoil covered the classic site, and an electricity pylon was planted on it too: in addition, agriculture had crept up the valley sides and thin fields of barley were covering every scrap of cultivable ground. Only the rockiest areas are left untouched. Given that this pass is at 3600 m the crop is likely to be minimal, but such is the pressure on the land of the incredibly fast-growing Ethiopian population - which makes all conservation there a tremendous challenge. Barley in the foreground: the white scar is the site of the original 'dwarf poker knoll'. 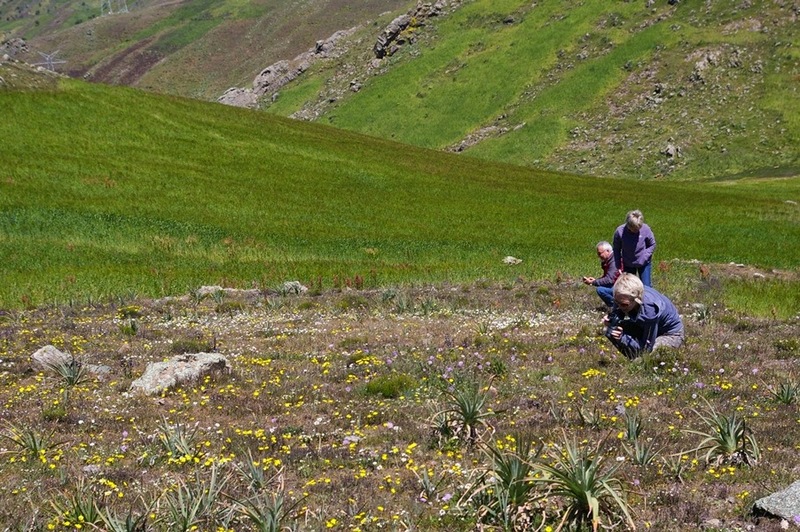 My companions (Kirsty Shaw & Suzanne Sharrock from Botanic Gardens Conservation International, Boyce Tankersley from Chicago BG) photographing flowers in a relict rocky patch of alpine habitat - an island in a sea of barley. 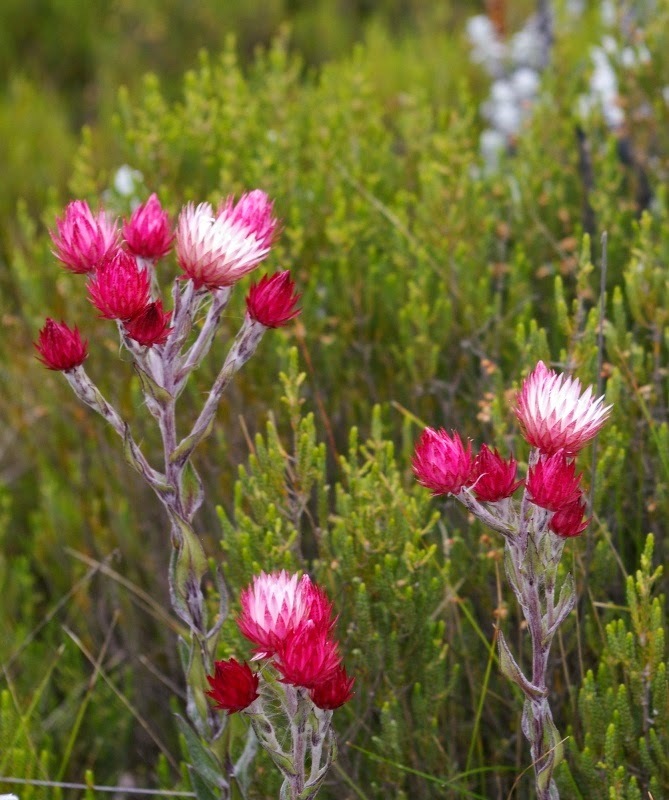 On this occasion we had plenty of time to explore the area, in beautiful (but burning) sunshine, and found it full of flowers, in about as colourful a display of alpine plants as one finds in tropical Africa. The dwarf Kniphofia was on its secondary spikes and there were only remnants of the larger species that also grows there, but everything else seemed to be in full flower. Here are some images of these plants, in a very threatened locality - one wonders if anything of this display will be left in a year or two. 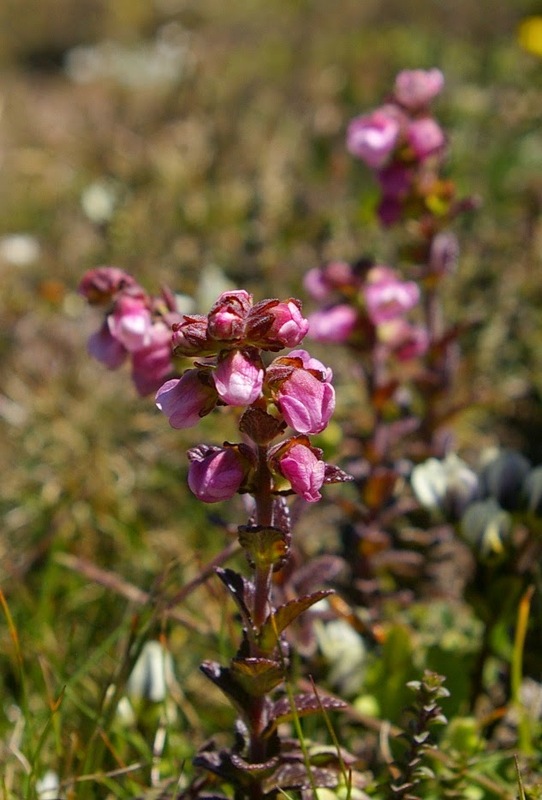 Above the road, in very short turf over rocks, are sheets of prostrate clovers, one with pink flowers and another with mauve: I think they are different species, but don't have a name for the mauve one. 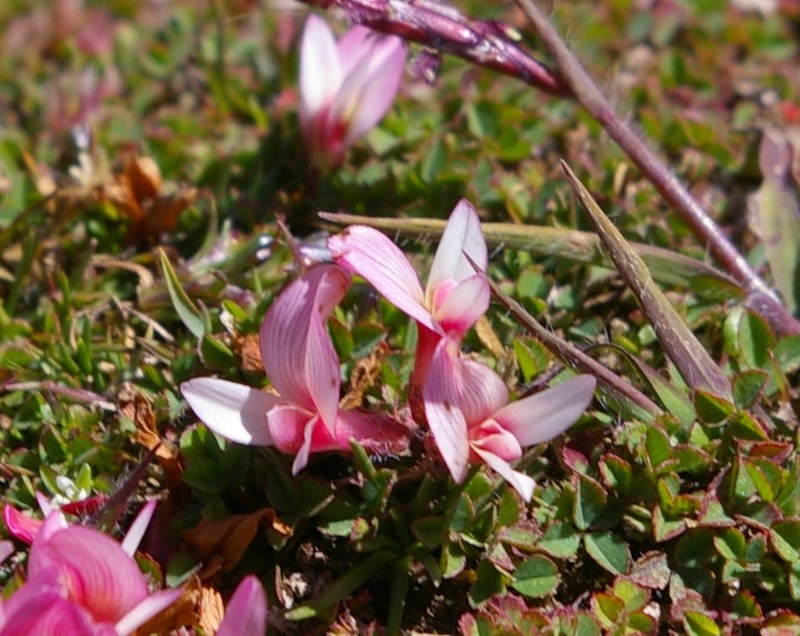 The pink species seems to be Trifolium acaule. The hemiparasitic Hedbergia abyssinica, named after the doyen of Afroalpine botany, the late Olov Hedberg. 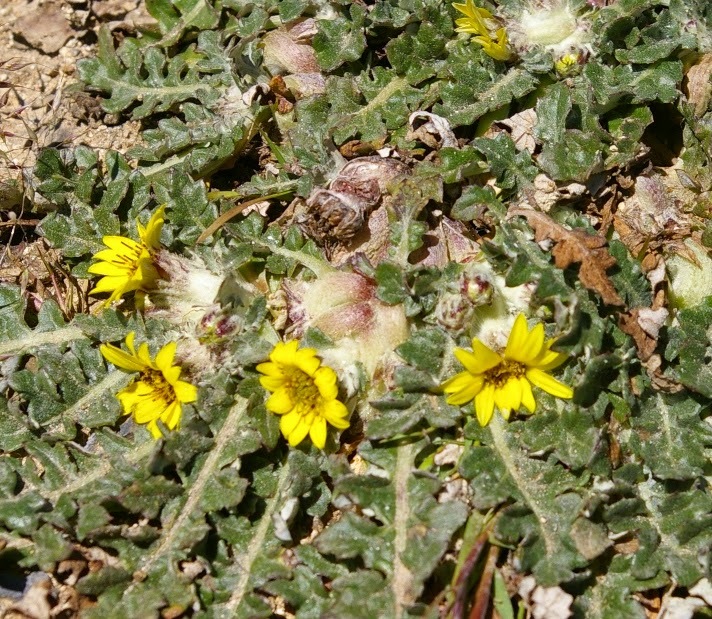 Plectocephalus varians has big, Centaurea-like flowers nestled into the turf. Hard prostrate clumps of Haplocarpha schimperi recolonizing roadside gravel. Salvia merjamie is quite a striking plant, with light blue corollas emerging from darker calyces, but it has a distinctly 'musky' odour. It tends to favour disturbed places. 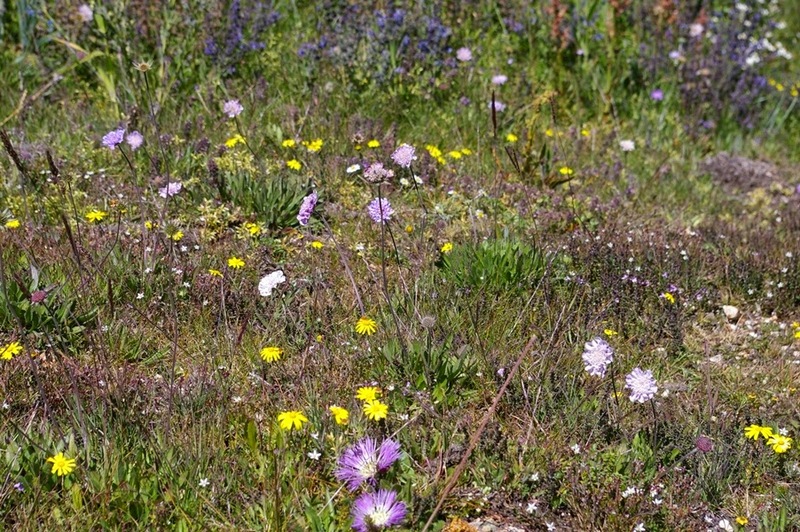 A mixture of alpine perennials: Plectocephalus, a Senecio, and Scabiosa columbaria, with various other little things. 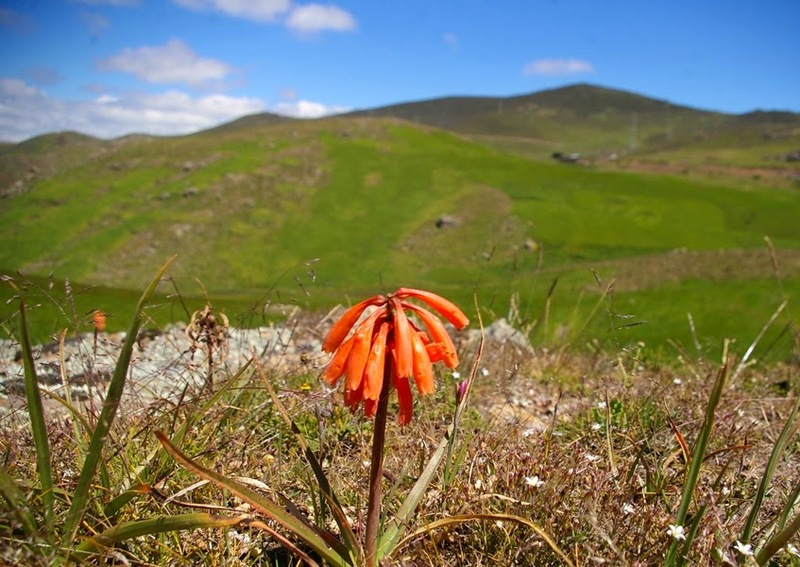 The dwarf Kniphofia isoetifolia has very bright orange-red flowers. In this habitat island it is accompanied by a larger Kniphofia, and masses of the white Anthemis tigreensis. Cineraria deltoidea and a Cynoglossum framed by lichen-covered rocks. Umbilicus botryoides among the rocks. 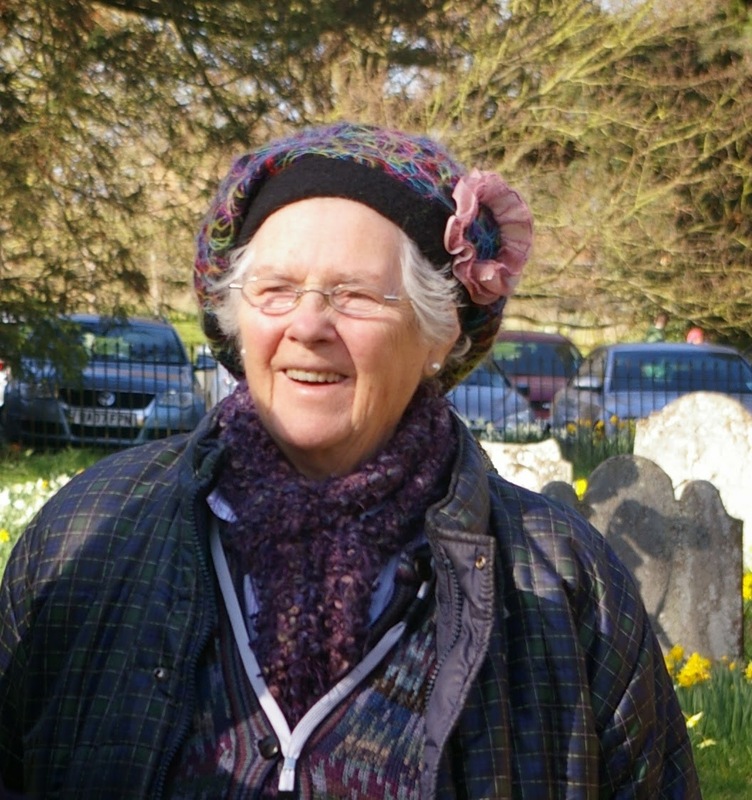 Margaret Owen, among the old fashioned daffodils she championed in Acton Burnell churchyard. The death of Margaret Owen in late October, sad though it is, came as no great surprise: she had never really recovered from heart surgery earlier in the year. 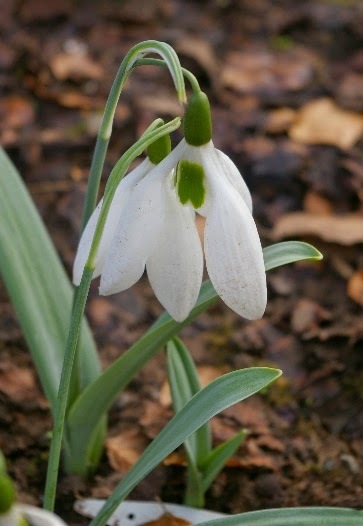 It was entirely typical of her, though, that she had insisted on postponing the operation until after the end of the snowdrop season and its culmination in her lunch party and then open day and sale at her garden, The Patch. 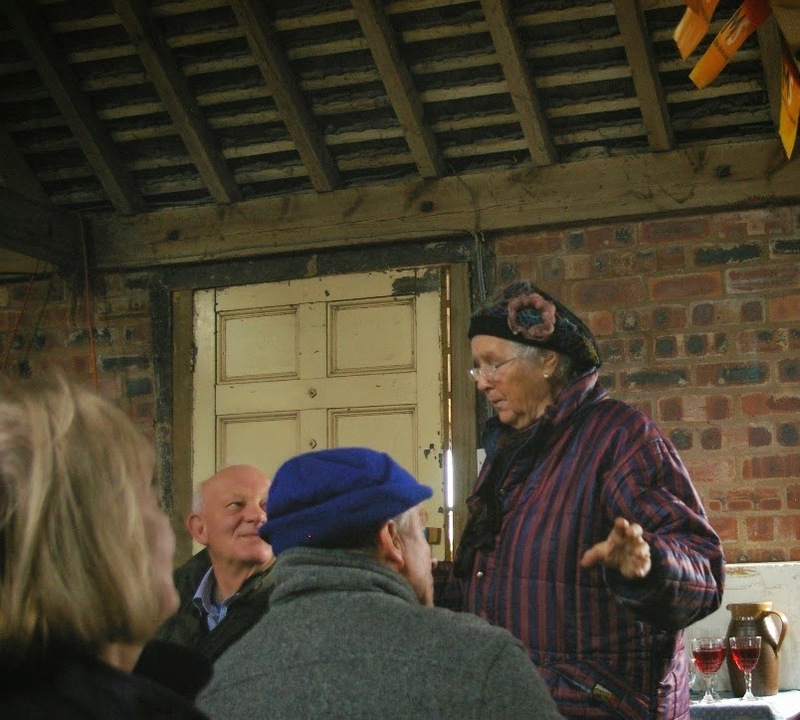 Margaret was a redoubtable figure in horticulture and the wider community in Shropshire, her adopted county. As her obituary in the Daily Telegraph put it, rather delicately, 'she had a flair for organising people.' The obituary is good on her horticulture, but it plays down her contributions to wider society - the campaigning on behalf of the Shrewsbury Museum, the leading of a team of seamstresses in recreating a valance for the 16th century Corbet bed, organising the flower rota in Shrewsbury Hospital and charity bridge competitions, among many other good works. It was for this community service that she was awarded the MBE in 2010. As a gardening friend one only saw the fringes of this - for example when instructed to sign a petition to save the museum, or similar. We knew her as an indefatigable gardener, turning up all over the place, especially in the counties of the Severn valley but also regularly attending the RHS shows in London or events at Wisley. Her opinions of the RHS and some of its staff were decidedly firm, and frequently expressed at some length: eminent persons on Council were known to dread an encounter with her. 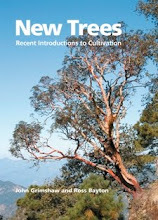 This did not stop the RHS awarding her the Veitch Memorial Medal in 2012 in recognition of her contributions to horticulture, which were many. 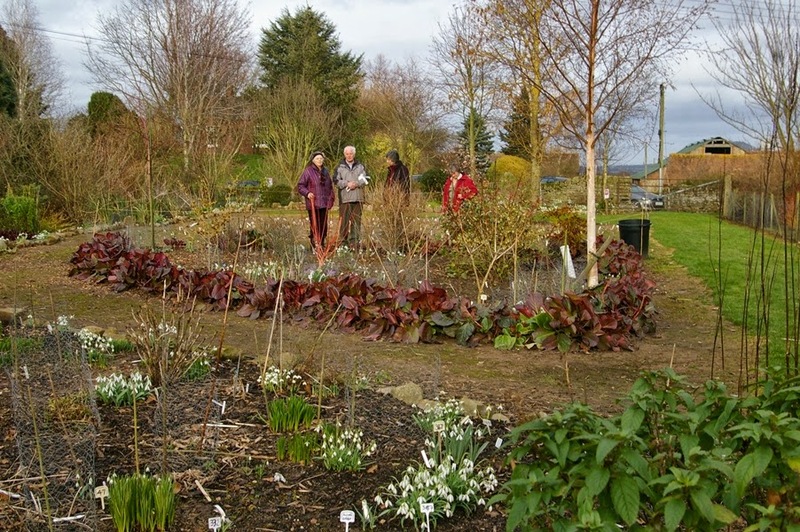 Margaret Owen (L), with guests at her snowdrop lunch at The Patch this February. As with so many gardeners, she was at her best in her own garden. With her husband Godfrey, Margaret had farmed land around Acton Pigot, in Shropshire, but his early death in 1983 had led to her passing the farm to her son, and moving out of the farmhouse to live in Shrewsbury. She retained an acre or so of land from the farm, however, to create a garden: it became known as The Patch. It consisted of many beds separated by narrow paths, in which she grew a diversity of plants from shrubs and trees to small bulbs, becoming famous for her outstanding snowdrop collection, but with very many other good things represented too. She had founded the Shropshire Group of Plant Heritage and held National Plant Collections of Veratrum, Camassia, Dictamnus and hardy Nerine: an RHS trial of these is currently underway at The Patch. It is an ideal garden for testing hardiness, being an unforgivingly cold site. A charming short film of her explaining the joy of snowdrops is to be found here. Never knowingly seen without an imposing hat or bonnet on her head, Margaret was a forthright individual and fell out with people on a regular basis, though quarrels were generally made up. Friends would be invited - or summoned - to her snowdrop lunches at The Patch. Getting there, down miles of winding lanes, was always something of an expedition, but it was worthwhile for the excellent company gathered, the interest of the garden and the lunches provided by Margaret and her helpers. The lunch itself was held in a shed, known to some as the pigsty, and despite large space heaters, it was worth being well wrapped up. Seating was so tight that it was almost impossible to move, but food and drink was passed along the tables and nobody went hungry. Margaret making a point to Chris Sanders. 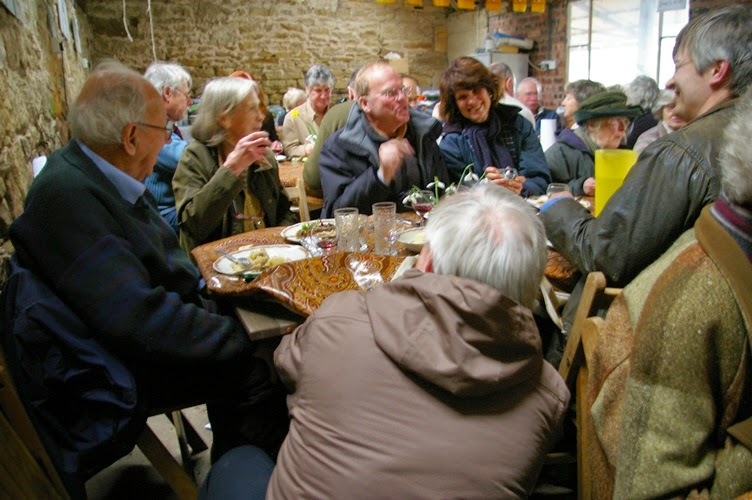 The last snowdrop lunch at The Patch - galanthophilic notables squashed into the shed for an excellent meal. I never attended one of the open days at The Patch, but they were very popular occasions and the sale of snowdrops, lifted there and then from the garden, raised remarkable sums for the Multiple Sclerosis Society. 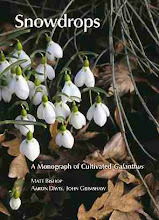 Margaret's most famous snowdrop discovery was G. elwesii 'Godfrey Owen', a form with six outer and inner segments, giving a very attractive floral shape. As a good grower it has become very popular. Others were less noteworthy, perhaps, but I like G. plicatus 'John Long', a very free-flowering clone forming dense clumps. In due course a large G. elwesii var. monostictus was named 'Margaret Owen', but it's unfortunate that she's not commemorated by something more distinctive. Her own default position was to name good plants after her late husband, so there are an Iris, Bergenia and Nerine named 'Godfrey Owen' in addition to the snowdrop. In recent years Margaret had developed a passion for old-fashioned daffodils and in 2012 held the first of what was intended to be a series of study weekends on them. It turned out to be the only one, but everyone who attended will remember it fondly. It exemplified Margaret's passionate plantsmanship and her skill and determination at organising things: battleaxe she may have been, but we shall miss her hugely. 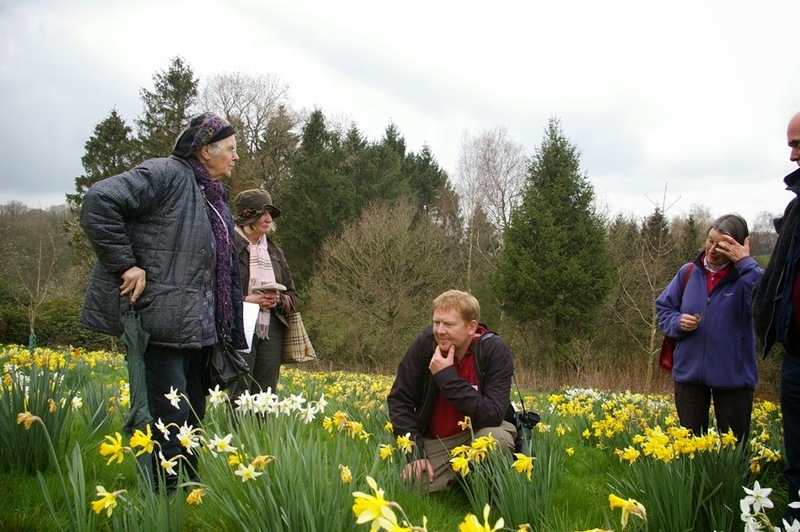 Margaret Owen discussing old daffodils, April 2012, with Tom Mitchell, Catherine Erskine and others. 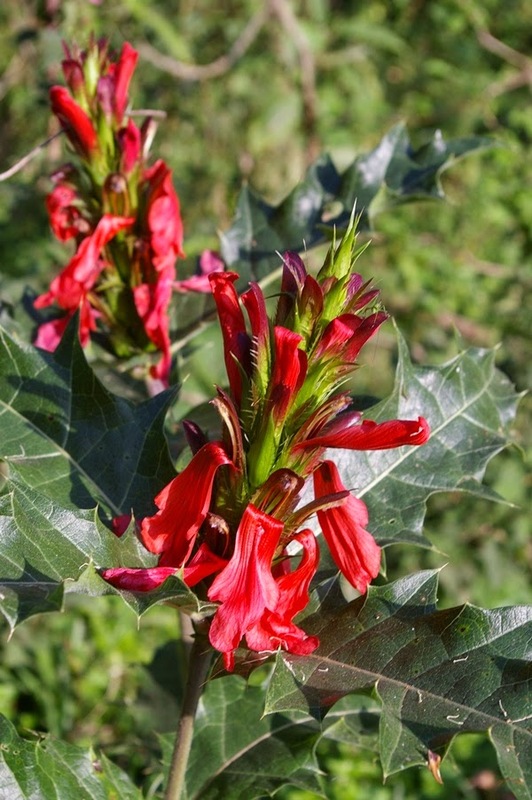 The fabulous Acanthus sennii, a prickly brute of a suckering shrub with satin flowers, common in scrubby roadside places at 2500-3000 m.
I have been in Ethiopia for a couple of weeks, principally to take part in a workshop for Ethiopian botanical gardens (of which more anon), but with the chance to do some travelling around as well. It was my third time in this beautiful and fascinating country, with its extraordinary diversity of scenery, long proud history, charming people (with a delicious cuisine), and a very rich flora. 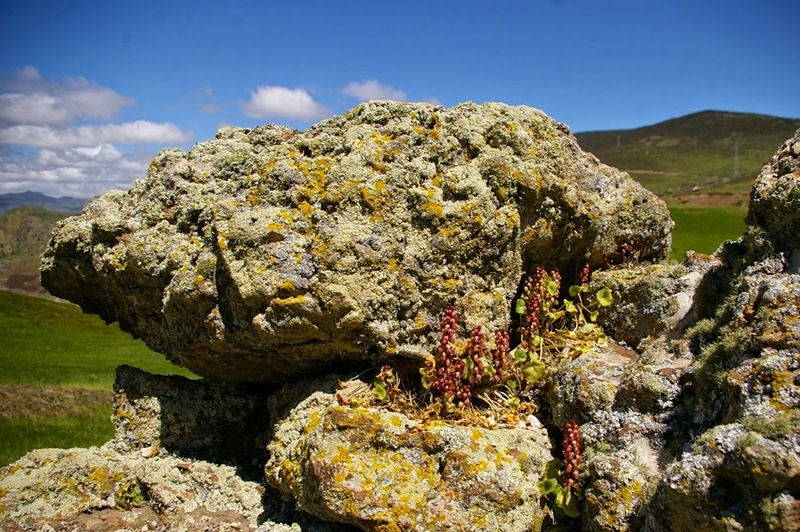 Sadly most of the natural vegetation in the highlands has been destroyed by agriculture and settlement, but here a few interesting plants, and more will follow. 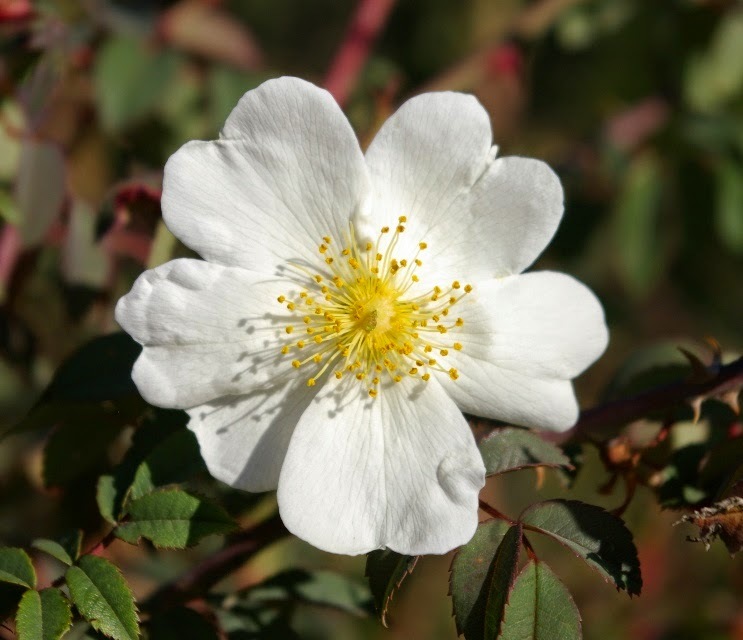 Rosa abyssinica is the only rose native to sub-Saharan Africa, common in dry montane forest, often with Juniperus procera. It's a scratchy dog-rose, with a faint scent. 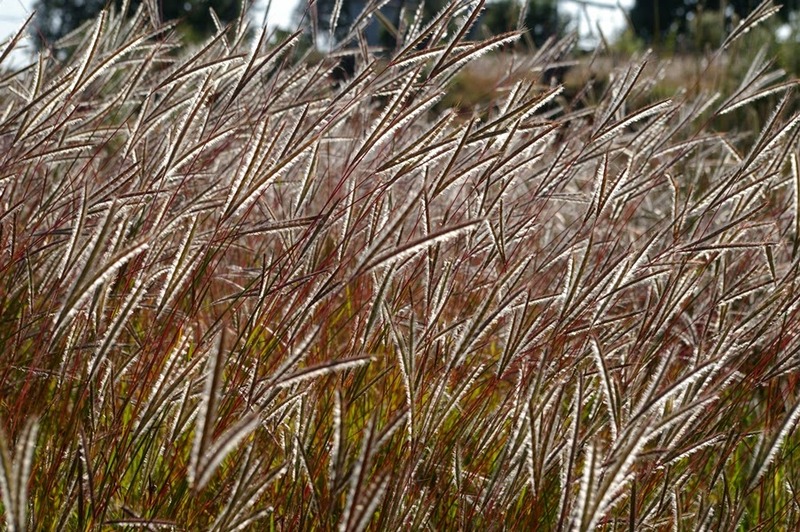 The exquisite grass Andropogon abyssinicus (so I was told, but that's supposedly annual and this looked perennial), catching the sun at Gullele Botanic Garden on the outskirts of Addis Ababa. It is a favoured pasture grass. Probably Crotalaria rosenii, a shrub of about a metre, in disturbed places at Gullele. The epiphytic fern Drynaria volkensii on a tree in the Wondo Genet Arboretum. 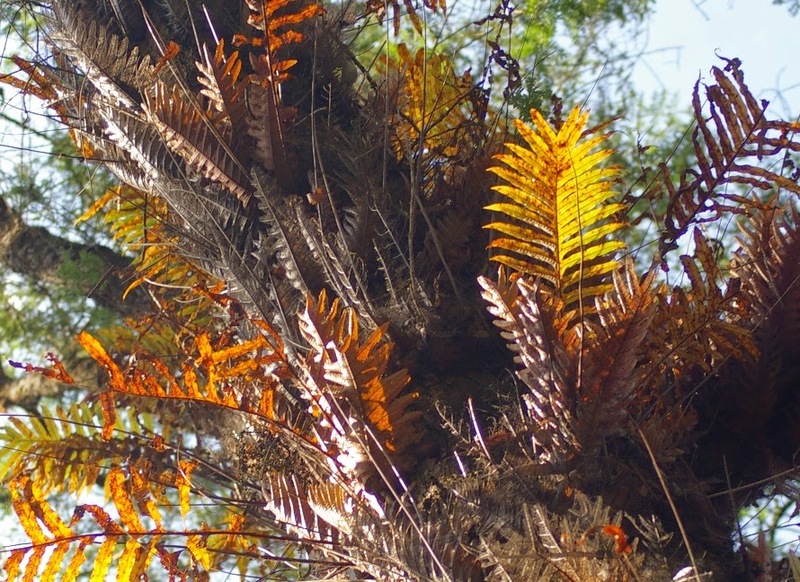 It has fronds of two forms: short sterile versions held close to the tree trunk and pointing upwards, and larger fertile fronds borne only for a season and currently turning brown prior to falling off. 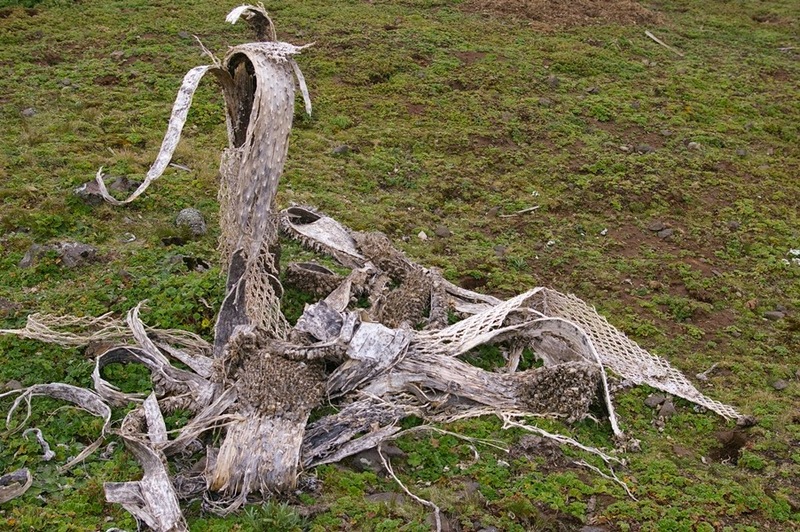 The persistent sterile leaves catch debris and moisture. A very vicious nettle, Girardinia diversifolia - an old enemy from Tanzanian days. 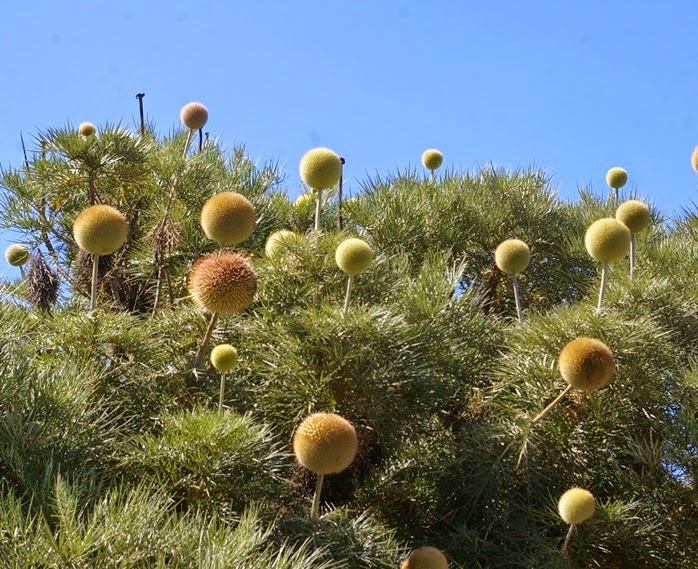 A first glimpse of Ethiopian 'botanical big game' - a hedge of the extraordinary Echinops ellenbeckii. 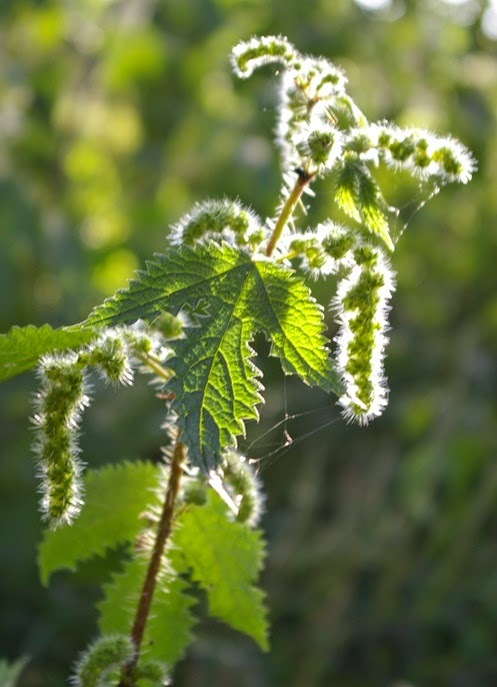 The shrubby plants are up to 4-5 m tall, and the capitula are 15-25 cm in diameter. When mature the flowers are red. 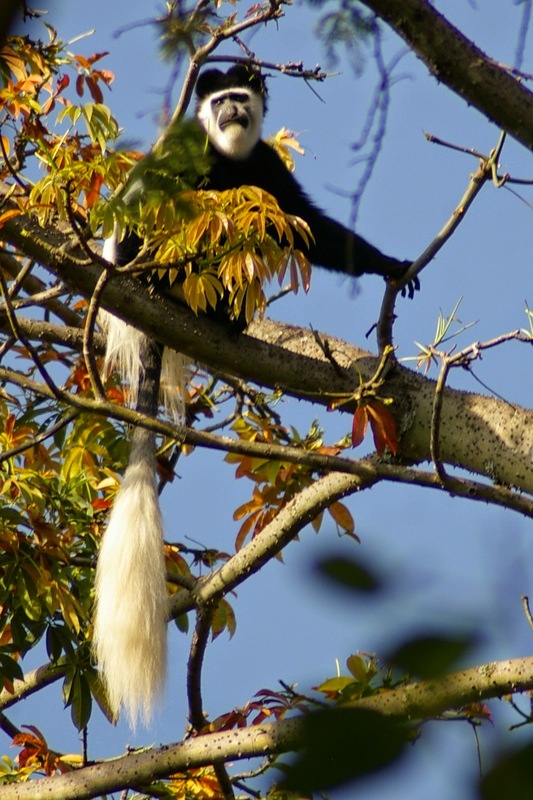 And finally - a Black-and-White Colobus (C. guereza) in the Wondo Genet Arboretum, feeding on Bombax leaves. The presence of folivorous monkeys is not something we have to worry about here!